Hello, i was wondering would a German shepherd be suitable for me and my family. We already have a dog and he is a border terrier/collie cross however he has been neutered. We live in quite a big house and have a quite big garden also. It may be left for an hour or so however it would be with our other dog. We are willing to give the dog over two hours of exercise with our other dog. Would a German Shepherd be suitable? It sounds like you have a nice home and that a German Shepherd just might be a good fit for you. But let me fill you in on a few other things to think about first before you bring one of these guys into your home. First of all, German Shepherds are fairly large dogs. And they do shed a fairly good bit so grooming will be one important part of owning a German Shepherd. Be ready for lots of dog hair. 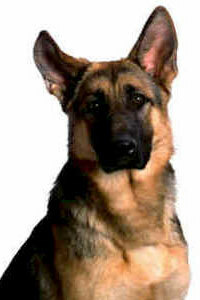 You can find more information out about grooming a German Shepherd here. Next, there are several German Shepherd health issues that can be associated with the German Shepherd Dog breed and you do need to be aware of these ahead of time. Now that's not to say that all German Shepherds will get all of these but you need to be aware of what might possibly happen. Also, German Shepherds are pretty active and need a good bit of exercise to remain happy and they love to have jobs to do. Plus, they are super smart so dog training is also a must - both mental and physical. You can do it yourself or you can hire someone to do it for you. Food wise, you will need to provide them a diet that is as good a quality food as you can afford. German Shepherd puppies grow really fast and need a diet to help them grow up strongly and support all their dietary needs. As adults, a good quality dog food will help them fuel all their daily functions and activities. And that's just a few things to think about to start off. But do yourself a favor and do loads of research first before bringing a new German Shepherd home with you. And there is a lot of information all about the GSD within this site and all over the web too. Good luck!